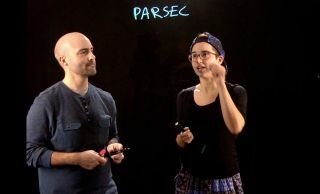 Paul Sutter and Anna Voelker discuss the parsec — a unit of distance equivalent to about 3.26 light-years — during an episode of the astrophysics-video series "We Don’t Planet." There's a new way to get your astrophysics fix. "We Don't Planet," a new series of 4- to 6-minute videos, explores some of the most fascinating concepts and objects in the cosmos, from dark matter and dark energy to supernovas and gravitational waves. You can watch all 18 of the videos here on Space.com, starting today (April 28). The first episode is about Earth's own sun, and every Friday, a new video will be unveiled. Each video will be accompanied by a brief explainer about the topic at hand. "The series is intended to be just a fun, lightweight tour of a variety of astrophysics concepts," said co-host Paul Sutter, an astrophysicist at The Ohio State University (and a frequent contributor to Space.com's Expert Voices section). "You can get your feet wet into these unfamiliar terms or unfamiliar concepts, to give you a platform to dig deeper." In the videos, Sutter and Anna Voelker, an astronomy undergraduate at Ohio State, discuss cosmic phenomena and draw cartoons in real time on a transparent markerboard to illustrate the ideas involved. "It's very unscripted and spur-of-the-moment," Sutter told Space.com. "That fits the horrible pun of the title — 'We Don't Planet.'" "I could talk about the parsec, but it is just so much fun to draw some pictures to show what's really going on when an astronomer uses the word 'parsec,' and where that word comes from," he said. Where did the word originate? You could look it up, but it really is more fun to watch Sutter and Voelker explain it. Check back in nine weeks.